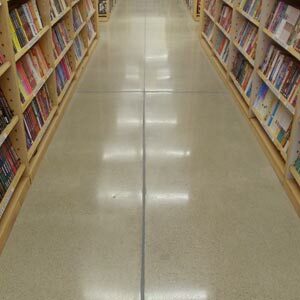 Concrete Polishing is becoming more popular. We really like this as an option for Industrial Warehousing as well as for Retail stores. Polishing takes place after the concrete has been ground with metal bonded diamonds. We like to classify this into five phases. First phase is the metal bonded diamond phase. Then the second is the low resin bonded phase, followed by the third phase which is the densifier phase. The fourth phase is the actual polishing phase, and fifth is the sealer phase. The metal bonded diamond grinding phase of polishing is the most important and most time consuming portion of the process. This phase can consist of as little as two passes, or a many as four. This all depends upon the condition of the concrete. 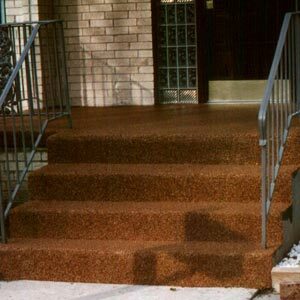 If there are coatings or sealers that have to be removed, there will be more steps. The low resin bonded phase is crucial to smooth out the scratches left from the metal bonded phase, then the densifier is applied. After the densifier is applied, we believe that the polishing begins. We can also stain or dye the floor to give it some color. The big advantage to this system is the low cost of maintenance. Some say no maintenance, but the reality is that there is always some degree of maintenance which we also offer. Concrete stain and dye can be installed to your existing concrete or we can install a cementatious overlay. Reactive stains, are stains that have an active element, usually acid, that reacts with the concrete. Acid stains will drive the pigment into the concrete by reacting with the free alkali in the cement. Clear sealers are applied to protect the stain. Sealers vary from water based curing agents to epoxies they can be glossy or satin finish. 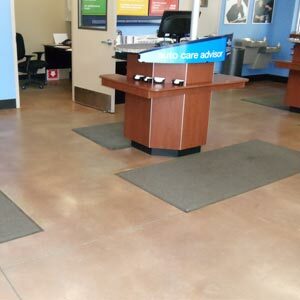 Concrete Dye, is designed to be installed with a polished concrete system. There are water based and solvent based systems which are spray applied and require a special spray system. Epoxy river rock systems are 100% solids epoxies with pebbles dredged from rivers. They are installed at thicknesses ranging from 187 mils (3/16 inch) to 384 mils (3/8 inch). There is a wide range of natural colored rocks. Currently we stock three of the most popular colors: Merrimac, Mini pearl, and Texas grit. Other colors are available upon request. The preparation recommended for this system is acid etching, and/or power washing, to clean the concrete. Entry Resurfacing This entry was cracking, we cleaned out the cracks, patched them and resurfaced with epoxy and granite stone. Steps This is a new home, the concrete steps were not attractive adjacent to the colored stamped concrete. The steps leading to the pool were in need of updating. We installed Mini Pearl aggregate with epoxy. Steps This porch had astro-turf on it and due to moisture retention was cracking. We removed the existing carpet and installed Texas Grit aggregate with epoxy. We use H & C Concrete Stain for staining exterior concrete surfaces including porches, stairs, walk ways, and concrete tennis courts. These film forming stains slightly penetrate into the concrete and color the existing concrete surface. There are a variety of colors and designs to choose from. The preparation recommended to clean the concrete for this system is acid etching, and/or power washing.